According to the Bureau of Labor Statistics data, “older households” – defined as those run by someone 65 and older – spend an average of $45,756 a year, or roughly $3,800 a month. I don’t know about you, but spending $45,756 after-tax a year in retirement sounds like a lot! Based on a 20% effective tax rate, $45,757 is equivalent to $57,195 a year in gross income. To generate $57,195 a year in gross income requires an investment portfolio of $1,429,875 generating 4% a year. Could it be that the average 65+- year-old retiree is a millionaire? Given we know the average 60-69-year-old American retiree has only about $198,000 in their 401(k) and only $63,000 if we look at the median 401(k) account balance, something seems off. Or, we can take the positive view that everything seems to always turn out OK in the end. After all, if you are a current retiree over the age of 65, you likely have some pension income and are certainly eligible for Social Security, which averages roughly $1,422 a month. Add on some financial help from respectful kids, and all is good for current retirees. Unfortunately, the same might not be true for future retirees. Let’s look into the juicy details from the BLS data. There are seven categories in total, which may be an interesting way to categorize our own retirement spending plans. Housing is surprisingly the largest expense by far for the average retiree. With the median home price in America at roughly $225,000, spending $1,322/month on housing seems quite high. Every personal finance enthusiastic should have their house paid off by the time they retire. After that, all that’s left should be maintenance costs, property taxes, insurance, and utilities. Therefore, it’s clear that the average retiree still has a mortgage to pay. If the average retiree had no mortgage, their housing cost would be closer to $300 a month based on the average home price in America. Pay off your mortgage folks! And certainly, reconsider the wisdom of renting for life. Renting long term is like shorting the stock market long term. Not a good idea. $567 a month for transportation cost is another surprisingly high figure given seniors get discounts for public transportation. For example, in San Francisco, depending on income, seniors get a 50% – 100% discount on their monthly MUNI pass, which includes buses and subways. Thus, their total cost, if they rely exclusively on public transportation, is either $0 or $47 for their monthly MUNI pass in one of the most expensive cities in America. As a senior, spending $6,814 a year for transportation makes it seem like they are constantly getting ripped off at the auto mechanic shop. Yet according to the BLS, the average household of other ages spends $9,000 a year on transportation costs. These ongoing auto expenses is one of the main reasons why everyone should spend no more than 1/10th of their gross income on a car. Overpaying for a car is truly one of the biggest personal finance killers for the average American. With senior discounts for public transportation and the invention of ridesharing, transportation costs should come down over time. I’m pleased to see that health care cost averages “only” $499 a month or $5,988 a year. The average health care cost for a working individual is closer to $20,000 a year and heavily subsidized by the employer. All this horror talk about health care costs spiraling out of control in old age seems to be exaggerated, so long as you have Medicare or some type of subsidized health insurance program. Just make sure you consider purchasing a long-term care insurance policy before its needed. The cost of long-term care can completely wipe out the average retiree’s savings. $483 a month for food is reasonable. With so many early-bird specials starting at 5pm, how can a retiree not save money? What a nice life to eat a steak dinner for 60% off, watch some TV when you get home, and go to bed by 8pm. Let’s just make sure the average retiree doesn’t get a hold of a food delivery app. If so, their food budget will go out the window. I don’t quite get this category because a 65+-year-old head of household is supposed to not be working. But the BLS explains that this figure is for those in the household who are still employed, pay Social Security tax, and perhaps some contribution to Social Security. In other words, one of the secrets to retirement is keeping your spouse working! By having a partner work past 65, it’s much easier to spend up in your retirement. Just make sure the working partner doesn’t resent you for living the good life. 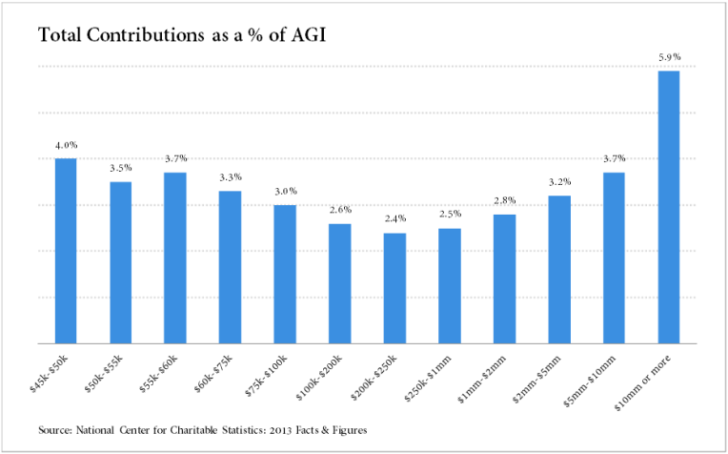 $202 a month or $2,429 a year in charitable donations accounts for roughly 4.2% of annual gross spend. 4.2% is a respectable amount since the average percentage of gross income donated to charity is closer to 3% in America, or $2,081. It’s much better to donate your money while alive than after you’re dead. At least if you donate while living, you can see and gain the satisfaction of knowing your money is getting put to good use. $197 a month seems low for entertainment. When you have all the time in the world, it’s easy to spend more money. Think about going on a 21-day luxury cruise to the Mediterranean or flying to Hawaii during Polar Vortex season. These activities cost money! But what I’ve found in retirement is that it costs less than I thought to be entertained. With so many free parks and activities open while most people are working, there’s always something for me to do in San Francisco. Because you’re so much happier being free, you don’t require as much expensive entertainment to counteract all the stress you experienced while working. My main conclusion from the BLS data is that the average retiree is doing splendidly well. 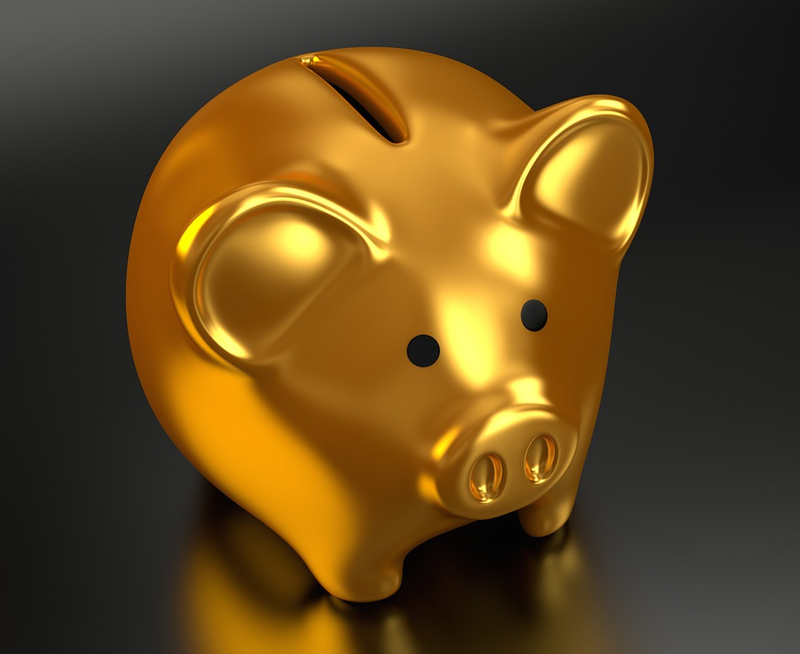 Being able to spend $45,756 after-tax or $57,195 in gross income each year is a handsome sum of money given the median household gross income is roughly $61,372. Put differently, the average retiree is able to spend 94% of the median household’s gross income without having to work! Given having the freedom to do what you want, when you want is truly the biggest booster of happiness, is it any wonder why our happiness increases with age? Based on this data, none of us should ever again dread getting old. But I will say, based on first-hand experience of leaving the workforce in 2012 at age 34, it’s absolutely worth it to consider accelerating your retirement date. It’s one thing to have money and freedom. It’s another level of satisfaction to have money, freedom, and health. Make no mistake, your body will slowly begin to fail you as you get older. It will take longer for you to recover from an injury or sickness. You’ll begin to feel more aches and pains after playing sports. And you’ll slowly start to lose your mental sharpness, especially if you aren’t consistently exercising your mind through the creative arts. Making sacrifices for early retirement is worth it. Putting in the effort while you have the energy isn’t a big deal. If possible, shoot to retire between 40 – 50 years old. Such an age range provides the maximum amount of time for wealth accumulation while also minimizing regret for working not enough or too long. Track your money carefully. 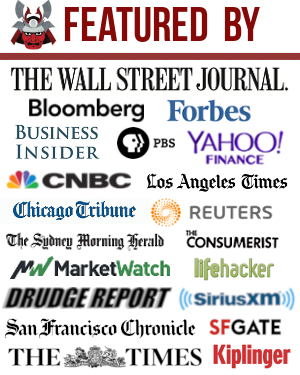 Check out Personal Capital, the web’s #1 free wealth management tool to get a better handle on your finances. In addition to better money oversight, run your investments through their award-winning Investment Checkup tool to see exactly how much you are paying in fees and whether you have the right risk exposure. After you link all your accounts, use their Retirement Planning calculator that pulls your real data to give you as pure an estimation of your financial future as possible using Monte Carlo simulation algorithms. There’s no rewind button in life. Make sure you have a proper handle of your finances. Our budget for retirement spending is $10,000 per month in after tax income in today’s dollars (for my husband and I combined). If we don’t need that much, great, but I don’t want to retire and find out we don’t have enough for how we want to live. I have a post on this if anyone is interested in more of the details around how I came to these numbers, the big unknown of the contingencies, the issues with relying on social security, etc. Sam, after 75 or 80, many retirees aren’t going to be traveling a ton and most of their monthly expenses will be related to health care (needing full-time caretakers or nursing home). I’m relatively young (Under 40) but why not just spend down your assets and get on medicaid at that point? Everything is free! We have people whose parents never paid a dime in taxes but we pay for full-time nurses and round the clock care for them, while punishing retirees who paid in the system for 40+ years, by making them pay out of pocket. There are tons of elder-planning lawyers out there! The reason the health spending is so low is because by 65, all the people with expensive lifestyle diseases are already dead! This is literally survivorship bias. Badumtisch. The spending data seems to be for households over 65, not retired households. It does not appear to differentiate between the spending of working households over 65 vs spending of retired households over 65. We can assume 100% of people 65 and older are retired and not working but that seems illogical. I think that’s right. Not 100% of people over 65 are retired, with some households having at least one working spouse, which skews the numbers higher. Not exactly sure how to read this. I personally would not want to be working over 65. Doing some leisurely writing here and there and volunteering, yes. But not working a FT day job. Completely agree on the not working over 65! Just wanted to point out the spending may be a bit higher (although not by much I would guess) due to possibly of existing employment. Great read as always! It just kills me when I go through a checkout line late at night and some poor woman who might be 70 years old is ringing up my stuff. If she’s still there, something went wrong in her life is all I can figure. The best I can do, at that point, is try to get her to laugh which, although I am not an extrovert by an means, I can usually manage. I am over 65 and retired from my “day job,” as is my wife. The biggest monetary difference is the about $16,500 payments we do not make to Social Security. I still contribute to my 401K. There is no difference in what we spend each year. None of this happens if we did not contribute the maximum to retirement plans for most of our working lives. There are no do-overs. As to the practicality of all this, and I am prepared to be labeled a sexist for saying that we could be bankrupt were my wife in charge of finances. It’s just the way it is. She does not know and does not want to know how to access our accounts. My wife has a degree in Math – so it’s not that. She just doesn’t have time to think about this stuff. It is really important for the person in a family who cannot manage money to not manage the money. And if no one can manage the money get some free advice, of which there is plenty and follow it. It’s interesting that people forget once they retire, they don’t have to save for retirement any longer, which frees up a lot more money. Good point on not paying the FICA tax anymore. The disparity at the beginning of the article is caused by bad math. You’re taking the MEDIAN 60-69 year old for retirement savings, and then comparing to the AVERAGE spending. That’s where your problem lies. Or maybe you are bad at reading? The median 401k balance is only $63,000. The average is $198,000. Maybe I need to do more bolding. I donno. I often wonder how many people I lose based on my inability to make things clear or a person’s inability to understand clearly. There’s a line between how simple I should write and getting really disinterested. Hmmm. Hmm, people that read things like Financial Samurai probably serve to move that average higher above the median. I am aiming for our 401k funds alone to be more than an order of magnitude above that average before we start RMD. Yes, we’d retire now, but we can’t bring ourselves to do that until we can start drawing from our pensions and social security, still more than a few years off. We’ve both been poor and neither of us has any desire to ever re-experience that, especially once we are out of the work force and probably no longer able to return, even if we wanted to. Even though it will mean selling a few non-retirement assets, we intend to retire when our pensions start at 63 and take SSI as well. The goal being to get to 70 (when RMD kicks in and ends all money concerns) without touching the retirement funds, but having some serious fun in the meantime and hang the expense. You will NOT take SSI – which is Supplemental Security Income – that is for the poor. You will take OASDI – Old Age Survivors and Disability Insurance. Can you elaborate on this by giving a number example. When SSA says you will get $1,700 at 67, what is the breakdown between SSI and OASDI and what is the difference? I guess most of us receive OASDI, but is this just semantics when someone who receives OASDI says s/he receives SS? Definition: SSI disability benefits are available to low-income individuals who have either never worked or who haven’t earned enough work credits to qualify for SSDI. Supplemental Security Income is a program that is strictly need-based, according to income and assets, and is funded by general fund taxes (not from the Social Security trust fund). SSI is called a “means-tested program,” meaning it has nothing to do with work history, but strictly with financial need. To meet the SSI income requirements, you must have less than $2,000 in assets (or $3,000 for a couple) and a very limited income. SSI applicants are somewhat more likely to be female as fewer women are eligible for SSDI benefits (about 71% of women compared to 79% of men), generally because women have fewer qualifying years of work (over 60% of men have worked at least part of every year of their adult life, while only 41% of women can say the same). All $1,700 would come out of the OASDI fund. OASDI a could be considered SS benefits. SSI is basically a welfare program for people that have not worked enough to get an earned benefit. SSI is mostly disability benefits. It can be retirement benefits for people with little earnings because they just never worked much or came to the US at an older age. The rules for older people moving to America late in life have been made much more difficult over the years. In the past you could bring your elderly parent saying you would support them. Then you stop the support and they got an SSI payment! In rear instances you can get OASDI and SSI. If your earnings are low and your earned benefit is say $500 you would get $300 in SSI to bring you up to the $800 SSI amount. Doesn’t happen often. Acronyms. I used to be good at them but as time goes by and they keep proliferating, I should probably seek to avoid them. What you said, although I’m starting not to think of 63 as terribly old. Either way, we intend to take social security income as I think we’d rather have it at the reduced rate, so we can leave the 401K funds alone to keep growing until RMDs, whoops, required mandatory distributions, kick in and we no longer need the social security (but will still take it, of course). So far as I know, after that we can leave the remaining non-retirement funds alone to grow for our kids to inherit since I can’t ever see us spending them (as we would be betting against living long enough to ever need them). Or possibly they could pay for rejuvenation therapy should George Church at Harvard be on the right track . . . although, should something like that come along I wouldn’t be surprised to see pensions eventually finding a way to terminate themselves, as well as social security. All of the $1,700 would come from the OASDI fund. SSI is limited to a maximum of about $800 a month. If someone’s earned benefit happens to be less than $800 it will be topped of to get to the SSI amount of $800. Not often. SSI is mostly benefit payments to people with limited work history and this they are no entitled to an earned benefits. It is mostly disability payments. Old age SSI payments do not happen that often. It used to be easy to bring in an elderly parent saying you would support them. Then you would stop the support and they would qualify for SSI. This was stopped some years ago. Thank you for this information and clarification. I bet the majority of Americans, including myself did not realize this. Snazster – you might want to run the calculations to see what tax bracket your RMD puts you in. It might be advantageous to draw from your IRA first and collect the higher social security at age 70. I don’t typically comment but I see much missing here. – first there was a bit of snarky sarcasm about retirees and money management/computer competency. Is this needed? I am 59, many many of my friends are in their 60’s and 70’s. They manage their money well, understand financial planning and use smart phones, computers and all the modern tools. Assumptions that this generation does not is sheer arrogance of youth. – second. property taxes and heating/air conditioning in many regions can be well over 1000/month. I have a second home in Chicago (condo) values at 120k and the HOA is 560 taxes 183 and insurance about 75 per month. That doesn’t include utilities that are owner paid. I sold a home there in 2003 for about 250k and my annual taxes were about 8k per year. 16 years ago. In most regions property taxes go up annually by a significant amount. – I did not look at the data in the original article but if it averages spend throughout retirement it should also provide by decade. The sixties to mid seventies is the time people travel more and stay in their homes. By the end of the 7th decade many people have moved in to independent living situations or assisted care. My 80 YO father just did this and it is all inclusive about 4600/month. He has very few additional expenses as food is included. He was s at a very nice place in an expensive area in NY but in Iowa where he moved from there were wonderful options under 3k/month. Others may move in with children at this point. Oh – my father does online banking. What a wonder. While his SS and pension don’t cover everything he sold his house for about 100k and this provides enough extra that he can likely stay where he is indefinately. – Medicare is wonderful. I helped my parents through my mother’s last years and they were medically complicated – except for paying. Medicare is well run and covers much, especially with supplemental. The people that help you plan the right supplemental are very helpful. Paying for supplemental is a better deal than paying the medical bills without it. It works. I am now sold on Medicare for all. – I just don’t think many of the posters here have much real experience with the breadth of retirement and what happens. It is a pet peave of mine that few retirement planners consider retirement by decade. It’s not you, Sam! It’s in the fifth comment. I think the number of pensions is a big factor in low 401k levels. My father never contributed to a 401k, but he had a pension from the company he worked for 32 at. He earned a small pension from the government job he took after he left the company, and that government job he was able to work at for 10 years. Dad lives quite well, and spends more than that average thanks to those generous pensions. Dad is a boomer. By contrast, I am not ever sure a I will get SS. I can say that my taxes and insurance for my home in the NY area is north of $1000 a month amd my home only 1800 square feet. I do not consider my home small, but for the county I am in, it is. We will retire to a LCOL area, and do the geo arbitrage. I dont see any way else for that to be done for most folks. Now, you dont need to move to the South to find a LCOL area in the NY metro. All you have to do is to get outside the commute range of NYC and the other major towns around here. Go north of poughkeepsie, and you are in a much cheaper area. Agree about the pension part. Similar to my parents. But I think there’s something where if you get a pension, you don’t get full Social Security….. there’s a trade off so you can’t have a max pension and max social security. I’ll double check. If the pension is from a government job sometimes that affects social security, but I don’t know of any instances where a pension from a company would affect social security. My dad retired from the post office and didn’t receive social security, but he also didn’t have to pay into social security. For the most part your social security benefit is based on what you paid into it over your career. OK, makes sense. If you pay the FICA tax, then you best get social security even if you get a pension and vice versa. Will ask my dad what his situation is. I recall that giving me a bad moment once upon a time. But that’s only if you work for a government and, even then, only if they give you a pension in lieu of paying into social security, which some state and local governments do. Fortunately, most that provide a pension also require that you pay into social security. In which case they shouldn’t affect each other. If you paid social security only part of your life, and then got one of those jobs without it, but with a pension, it gets complicated (of course it does). But if you worked 30 or more years paying Social Security taxes, your pension should not be affected. It would be a real bummer to only realize this only as you were nearing retirement, if you were one of those employees that hadn’t been paying into social security. Also keep in mind that if you have both a good pension and social security, up to 85% of your social security will probably be taxable (Federal only, not state if you are careful where you live). The data just shows that you need to be smart about your personal finances. Not when you are 50 years old bit when your are in your twenties. But think about all these retirees who have raised kids but have not managed their own finances well. Due to circumstances or otherwise. These kids will most likely follow in the same footsteps of their parents. Living the same paycheck to paycheck life that everyone wants to prevent but somehow do not make a reality. Hopefully these kids will look at the average retired parent and think again! Spending your money on useless stuff will not make you happy. Freedom to do what you love, with the people you love, very likely will! I think you need to re-evaluate your income and health care assumptions. If at 65 and retired, most take SSI. Also at 65 all retirees are on Medicare. So that maybe why those income and costs are explained. Because OASDI is the official name for what we typically call social security. And SSI is supplemental security insurance which is a welfare program. OASDI can be over $2,000 a month and varies based upon lifetime earnings. SSI is about $800 a month and everyone gets the same amount. I think the numbers are high, but only for my standards as a very frugal person. In my view, a senior should live in a LCOL area to pay less in housing and other general expenses. Your post suggests that a fair number of seniors do live the big life thus skewing the averages. Despite my frugal tendencies, I think it’s understandable. After working 40+ years, lots of people want to enjoy the fruit of their labor by having a nice car, eating at expensive restaurants and traveling internationally. What’d you wish for your parents? I’m sure you hope they’re living a good life. Whether boomers can afford it with their savings is another problem and already well addressed in your other posts. Considering the avg 65+ has a pension that for those of us under say 45 don’t, things do not look good for future retirees. Care to comment on how these numbers would work out in an expensive coastal city? For example, how much are you paying in (no longer deductible) property taxes and insurance for your San Francisco home? Sure. People spend more and have more in expensive coastal cities, given the cost is above average. Medicare has helped my parents a lot so I can believe it’s possible for the medicL expenses to be that low. But it also depends on one’s state of health. My mom has a lot of issues so she ends up paying for a lot of out of network expenses. Dental has been the worst. She has spent a crazy amount on dental work. Makes me want to take better care of my teeth so hopefully I won’t need so much work when I’m her age. Plenty of places have monthly property taxes higher than $1322 a month; maybe these folks have paid off their mortgages. Not really plenty of places. Only if you are in the Northeast or have multi-million dollar home would you be paying that much in property taxes. Fairly small section of the population. Not exactly true. Here in The Houston ‘burbs our property taxes and insurance easily run over $1,000 per month for an average $300K home. This is definitely not the northeast! The Northeast has 55 million people. More than a drop in the bucket, and apparently Texas, with its legendarily high property taxes, also has people in this situation. Not exactly a drop in the bucket, then. A significant number. I’m not sure why folks in low tax states should pay more federal taxes just because some states have high taxes. It’s not like the low tax states are benefiting from the high taxes of another state. It is a subsidy for high tax states. Not fair at all. I am an “average retiree” and I can assure you that I cannot live on my 3500 monthly before tax income combining Social Security, a very small annuity and my 401K distribution (required) of 610 from my total of $160,000 which got creamed thanks to this stupid President’s mess with taxes and by ruining the economy.
. What are you thinking. I pay $ 1100 for a mortgage and $400 monthly for my healthcare costs. I have a very old car…so there are repairs. I pay for gas—approximately three tanks full per month for $150.00, gas, electric and Oil heat bills come to about an average of $225 + per month and I keep my heat on 65 degrees which is COLD. From time to time, I buy groceries…haha…but $50 per week is VERY LOW and not enough fresh vegetables or protein.I pay for car insurance and property taxes.And I drink fairly inexpensive wines…from Africa and Australia…no fancy california wines here. I hope to go out once a week with friends, a movie and bite which costs about $35.00 total and that is with one glass o. And I pay nearly $200 a month for internet and cable TV—which is my main form of entertainment. Occasionally I get a haircut and a little color which is always about $125 even at haircutter…low rent air dos. Do the math, and you will see that I cannot live on that alone. I subsidize my income with taking more out of 401K. If I take too much out, I will go into a higher tax bracket. I live alone…have a simple life and pay for oil paints and brushes, canvases and once in a while sell a painting for $150—so my “hobby” pays for itself and keeps me busy. I am freaking out every night…laying awake wondering How I will manage and what else I can do without! So let’s say I take a total of another $5000 from IRA which decreases its principle amount annually and makes my total income (TAXABLE) about $%,000…I am living on the edge and I am upset with your article…what the heck are you basing your numbers on? I worked at high level jobs all my life, was a single mom and educated my son (Bucknell and Columbia University)…so my savings are decidedly modest, but not unlike most seniors. If you know another way, let me know…I live in a university town, Charlottesville, high cost of living but many free community services because we have some very good people who fund the Senior Center etd. I have a computer and a cell phone..(Bill for phone 70 per month). I have a trash service which is mandatory ( 28$ a month…) and once in a while, I splurge on a bottle of vodka. I’m only pointing out a few things/tips, because you asked. Just those 5 items would save you ~$775. ~$275 minimum if you didn’t want a roommate. And when you’re on fixed income, every dollar you don’t spend is really DOUBLE. Because you didn’t spend it, it is an increase over a yearly basis. For example, if you save $200 in spending per month, that’s $2400 you have in your account extra at the end of the year. Mr Hobo Millionaire thank you for taking the time to try to help JB. Your suggestions all sound reasonable. I know of a way. Ask your highly educated son to help! Tell him your issues, and I’m sure he will be more than happy to work out a plan and assist. Those two colleges are so expensive, he can’t help but want to give back. Similar to Mr Hobo’s comment, collecting some rent would be a great way of supplementing your income. Perhaps if you don’t want a permanent roommate, you could try AirBnB or similar? Charlottesville is a popular tourist destination. You could meet new people and have some flexibility as well. I also think you can try to negotiate down some costs… For our cable bill, we call every year toask for a lower rate. It’s annoying, but an easy way to save at least a few hundred a year with a simple 15-min call. The same could work for asking for discounts on phone bill and even hairdressers. “I’m a senior on a fixed income” is a very good point. Sam is right though, your son should be able to give better suggestions than us. I wish our parents asked for more advice on money. I guess it’s hard to overcome pride and/or always seeing us as kids. There is definitely something missing as I watch my own personal version of this play out. Spending matches or exceeds your data but the net worth and cash flow (pensions, etc.) do not. Dealing with our aging family has turned into what we call raising our geriatric teenagers. You can’t reason with them, you can’t control their spending but you know they are running out of money. Couple this with the 65+’s set growing awareness of their own mortality as contemporaries begin to pass away or age into care facilities it is a black hole of FOMO spending. In the last year we have heard justifications for overspending such as “we may not be well enough for this trip in the future” , “this is our last car ever”, “there just may not be more years left”. However the facts remain these family members are in peek health and more than a decade younger than when their parents died. We have had to revert to the “choices” talk (a la teenage parenting). You can choose to spend your money today, but that choice will impact your standard of living in 5 years. This falls on deaf ears so if any other reader has a technique that works I’m all ears! Hi do not envy your situation, Hillary. Just know you’re not alone. I saw this play out with my mother the last 5 years (she recently passed away). She was never good with money. Actually that’s an understatement. She was a child when it came to money. Her biggest fear was she would leave “too much”. I kept reminding her “I have no idea” how long you could live, and if you live 15 years, you will run out of money at this rate. But if you spend X, you’re good for 10 years. All you can do is show them the math (even though they don’t always comprehend it), and say if you continue to spend X, you will run out of money in X years (and we won’t be able to help you that much). You sound like a good, caring, daughter. It’s very hard. I wish you well. I’m so sorry for your loss! Thank you for your kind words of commiseration. It isn’t about the money they chose to spend but more about the quality of life I can ensure for my parents and the requisite amount of money that requires that has me concerned. It breaks my heart to hear from the commentor above, I know she too is not alone nor doing anything financially “wrong”. We are trying to come up with acceptable ways to “employ” our older family members but pride is our enemy. They look at me like I am nuts when I suggest that I pay them for their support when they watch our son on no school days or when they run to Costco for me, things I would and do pay an employee or instacart handsomely to do on any other day. It’s there. But I’ll help you do the math in a follow up post, b/c SS doesn’t nearly account for all the spending. Look at your own SS benefit. To me, the surprise is the transportation cost. Did they include the cost of the vehicle too? We don’t drive much and usually spend about $50/m on gas. The healthcare cost looks suspiciously low. I guess Medicare/aid cover a lot. Other than that, the rest looks okay. $45,757/year really isn’t that high. 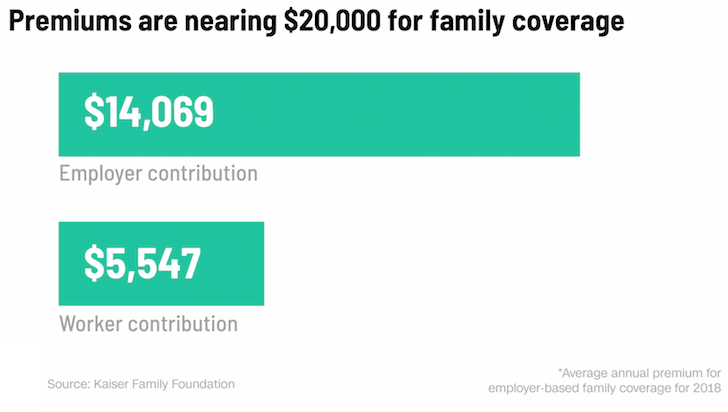 Most working families spend more than that, I think. How would the numbers change if you considered the average Social Security income? For example, I’d imagine the portfolio value required using 4% would be reduced substantially from the $1.43M figure. The average Social Security benefit is about $17,500 a year. So you can reduce the $1.43M figure by 35%. I’ve got a new post coming up to highlight the numbers in more detail. Don’t know if it’s possible but one thing I suspect (have not proven via numbers) is that each year the % of social security women receive increases quite a bit more than the normal inflation rate. I am 47. My parents era, a stay at home mom was much more prevalent that it is today, or will be tomorrow most likely. So the additional benefit of both spouses receiving a significant benefit will rise to perhaps $35,000 per couple if we double your average. That of course assumes we “fix” social security at some point. If the average person over 65 years old is like my grandparents, they struggle for money all years and then try to give each grandchild $50 during Christmas… Luckily, we have a good family that supports one another. We would absolutely help them out during difficult times (and have). So I think it’s an education thing. Older folks don’t understand finances and certainly don’t understand them now that everything financial is also online. In one of Jack Bogle’s books, he mentioned something about our brains slowing down as we get older and things like finance become more difficult to understand. It’s important for the elderly to have someone they can trust to help them out with that sort of thing. Mr. Bo Dangles, I disagree. I have been around a lot of old people (when I started work, I think the median age was around 60) and it seems to me that the if the person keeps their minds and bodies fit and active they retain most if not all their faculties. My folks for example live a sedentary life and their minds and health are going. On the other hand, my gran who is 80, lives alone (lived alone her whole life by choice) is still sharp. She works in a small family owned clothing store, climbs 3 flights of stairs daily and is in excellent health (except for a little high blood pressure, nothing minor medication can’t sort out). In fact last year she had her cataracts taken out and she now has better eyesight than me! My neighbor down the road was 75 when she passed because she elected not to have heart bypass surgery (she didn’t want to be a burden to anyone). But up until the day she died, she was extremely active and even took public transport to do all the household errands including shopping (carrying groceries by hand) and bills. I’m also reminded of a few years back when I was standing in line at a bank and a retired school principal (age +65) had come to sort something out erroneous charges on his account. The bank clerk was telling him how the account works, etc. but that man started quoting the contract and eventually proved the clerk wrong. I was in awe. That’s my aim, to not lose my edge, to stay active in mind, body and spirit and live a better quality of life in old age. And it seems to me that waking up everyday with a mindset of getting something productive done keeps the aging blues away. P.S. My book link is in the Website field. An interesting look at retirement spending by category. I suspect the transportation expense averages more than expected because younger retirees tend to travel a lot. For example, my parents take at least 4 trips per year and surely spend more than the average statistic you cite. Their life satisfaction has markedly improved in the past 5 years as a result. 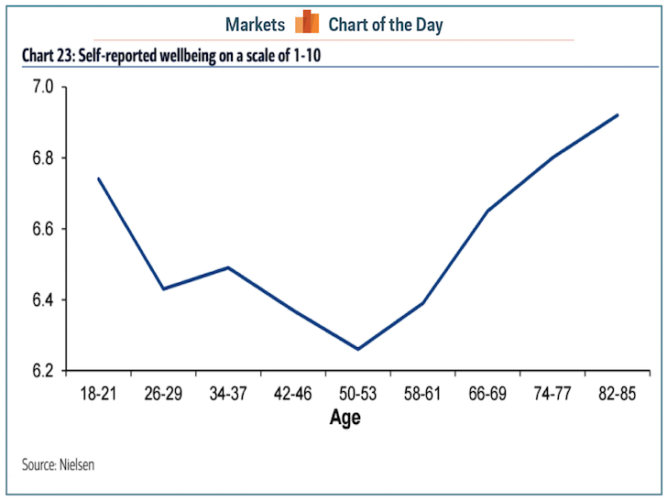 Which leads me to your final chart on self-reported well-being. I can vouch for its accuracy with my parents and feel satisfaction in my current (younger) life. The chart’s message also matches with a similar survey taken by my company. It showed high satisfaction with life and your career at the outset when you start working and you don’t know any better. However, results quickly take a nose dive after 5 years with the company. They show frustration with lack of career progress, general work dissatisfaction, or other contributing factors. Usually, you hit the nadir in your 50s when the kids attend college and you realize you need to contribute more (or start contributing) to your retirement savings. As time progresses and you finally save money, retirement seems possible. Your satisfaction skyrockets because you’re able to live the life you’ve always wanted. We called the 5-25 year tenure at my company “the trough”. I made 5 years yesterday and hope to avoid the Mariana’s Trench of employment satisfaction. Those numbers do feel a bit skewed. I think it would have been very beneficial for the study to reveal median numbers in addition to average numbers just in case some extremes at the high end shifted the data quite a bit. Property tax still can be a major expense for households even with a fully paid off home. My property tax right now adds about $340/mo to my household expenses by itself and I think I live in a low cost of living area so I can imagine it is much worse in some parts. Vehicle expenses did seem high as well. Without the need to commute to work, etc I would have anticipated it being a lot less. I also agree that the entertainment expenses seem very low as well but you make a good point that a retiree can take advantage of off-peak rates as well as last minute deals. Data data data, I love it! As you mentioned many of these folks who are now 65 and older have pensions, a species that’s been on the endangered list for a long time and will soon be mostly extinct, relegated to zoos. And it’s yet another thing to have Time Freedom, the best freedom of all! WHAT exactly are you getting at? What has “TIME freedom” to do with realities of day to day life, in different parts of the country to different groups of people? I’m financially independent and only work 2 days a week, and I’m in my 40’s. That’s my day to day life, and it could be for others too. I have more time freedom than most since I only go to work 2 days a week.